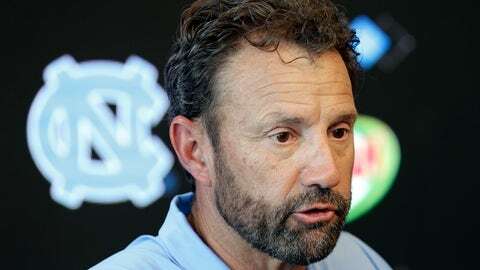 CHAPEL HILL, N.C. (AP) — North Carolina coach Larry Fedora isn’t deviating from the normal plan for early in preseason camp, even with 13 players facing suspensions for secondary NCAA violations for selling team-issued shoes. The focus remains on installing basic schemes for at least a few more days, though the coaching staff will soon start adjusting the amount of reps for players facing suspensions as the Tar Heels prepare for the season opener at California on Sept. 1. The school announced last month that it had reported the violations to the NCAA, then revealed Monday which players were being penalized and for how many games. Most notably, the list included four-game suspensions for quarterback Chazz Surratt — who had been expected to battle for the starting job — as well as returning starter Malik Carney at defensive end and another possible starter in fellow end Tomon Fox. The bulk of the suspensions are for rotation players, players yet to see their first college action and a couple of walk-ons. Fedora estimated the team has gotten through “97 percent” of its installation work ahead of Saturday’s intrasquad scrimmage. From there, the plan would be for coaches to review where every player stands, then begin to shift the reps accordingly with an eye more toward game preparation. Yet he made that sound normal, even in the abnormal position of dealing with so many suspensions. The offensive line has four players down the depth chart facing suspensions: redshirt freshmen Brian Anderson (four games), Jordan Tucker (four games) and Jonah Melton (one game) along with walk-on Quiron Johnson (four games). “We’re always mixing and matching all the time to find the best five, the best combination of five,” Fedora said. “But then you’ve also got to be prepared that if this guy goes down, how does that combination change? Is it the next tackle that goes in if a tackle went down? Or are we better with the next guard going in and this guard sliding over to tackle. One positive for the Tar Heels is the starting lineup will largely be intact for the trip to Cal. The NCAA agreed to a school request to stagger the suspensions for Carney, Fox and fellow defensive end Tyrone Hopper (four games) because they all came at the same position. So Carney and Fox will play in the opener before beginning their suspensions, Carney in Week 2 at East Carolina and Fox in Week 5 at Miami. In all, 11 players will miss the Cal game.